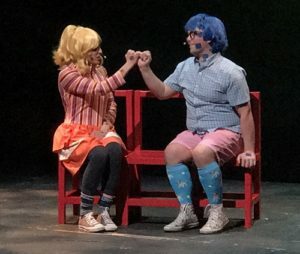 Time is running out to see the most endearing children’s show with a subtle, but strong lesson on inclusion and acceptance; “Polkadots: The Cool Kids Musical,” ends this week. 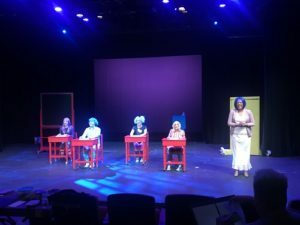 “Polkadots” closes March 23 at Theatre for Young America, on the lower level of Union Station on the City Stage. The show is based on a concept by Douglas Lyons with music by Greg Borowsky and Douglas Lyons. In a world of shapes instead of people, all the squares go to one school. And, it’s only squares at this school until something changes. 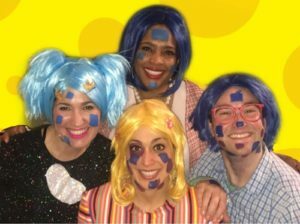 When new girl enrolls into school, a polkadot, she finds she is not accepted because she is different. She must wait for a polkadot water fountain to be installed. No squares want to play with her or talk to her. When she does make a friend, she finds that even making a friend is difficult. The shapes in this story reflect the attitudes and teachings of their parents and their learned behavior reflects the fear of anything new and different. The theme of the show sounds dark and dismal, but music makes the mood bright and lighter. As the show continues, the barriers break down and friendship blossoms. The show gives a great message about friendship and acceptance. 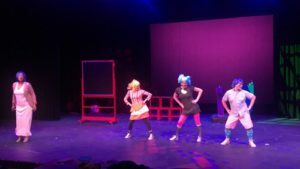 “Polkadots” uses bright costumes, wigs, music, and dance to tell the story and keep the young audience entertained. 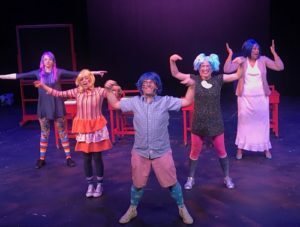 Choreography is based on some current kids’ dance moves from the fortnight dances, so many young audiences know. Lyons said that his idea stemmed from a video Phylicia Rashad talked about growing up in the segregated Jim Crow South. She discussed her curiosity about the ‘white only’ water fountain. According to Lyons, one day, when no one was looking, Rashad tasted the water from the forbidden fountain. Lyons said that the visual of that simple action triggered a light. “The innocence of a child is such a beautiful thing, and through the world has attempted to divide races. Children in their very basic sense see no color, Lyons said. The cast is: Kyra Weinberger as Lily, Franci Witte as Penelope, Steven Eubank as Sky, Tiffany Harper as Ms/Mama. The production staff is Valerie Mackey, director; Steven Eubank, choreographer; Alexandra Piley, stage manager; Tim Braselton, music director; Mieke Westra, properties master; Charlie Weitkamp, technical director/set designer; Zachary Hampton, costume designer; Sheryl Bryant, education director; Kylor Greene, lighting designer.